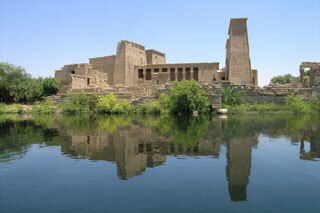 Philae is currently an island in the reservoir of the Aswan Low Dam downstream of the Aswan Dam and Lake Nasser, Egypt. Philae was originally located near the expansive First Cataract of the Nile in Upper Egypt and was the site of an Egyptian temple complex. These rapids and the surrounding area have been variously flooded since the initial construction of the Aswan Low Dam in 1902. The temple complex was later dismantled and relocated to nearby Agilkia Island as part of the UNESCO Nubia Campaign project, protecting this and other complexes before the 1970 completion of the Aswan High Dam. This article uses material from the Wikipedia article "Philae Temple Complex", which is released under the Creative Commons Attribution-Share-Alike 3.0 License.